In the Battle of Aspern-Essling (21–22 May 1809), Napoleon attempted a forced crossing of the Danube near Vienna, but the French and their allies were driven back by the Austrians under Archduke Charles. The battle was the first time Napoleon had been personally defeated in over a decade. However, Archduke Charles failed to secure a decisive victory as Napoleon was able to successfully withdraw most of his forces. 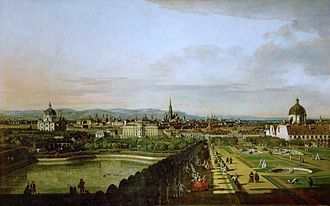 At the time of the battle Napoleon was in possession of Vienna, the bridges over the Danube had been broken, and the Archduke's army was near the Bisamberg, a hill near Korneuburg, on the left bank of the river. 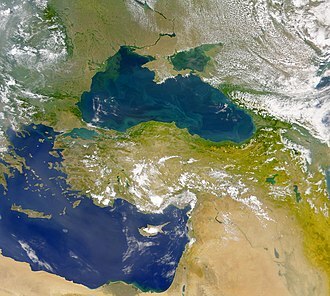 The French wanted to cross the Danube. A first crossing attempt on the Schwarze Lackenau on 13 May was repulsed with some 700 French losses. Lobau, one of the numerous islands that divided the river into minor channels, was selected as the next point of crossing. Careful preparations were made, and on the night of 19–20 May the French bridged all the channels on the right bank to Lobau and occupied the island. By the evening of the 20th many men had been collected there and the last arm of the Danube, between Lobau and the left bank, bridged. Masséna's corps at once crossed to the left bank and dislodged the Austrian outposts. Undeterred by the news of heavy attacks on his rear from Tyrol and from Bohemia, Napoleon ferried all available troops to the bridges, and by daybreak on the 21st, 40,000 men were collected on the Marchfeld, the broad plain of the left bank, which was also to be the scene of the Battle of Wagram. The Archduke did not resist the passage. 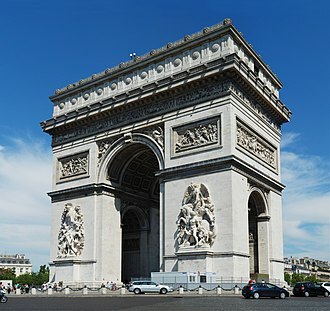 It was his intention, as soon as a large enough force had crossed, to attack it before the rest of the French army could come to its assistance. 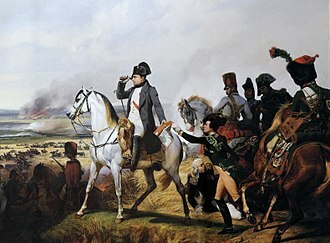 Napoleon had accepted the risk of such an attack, but he sought at the same time to minimize it by summoning every available battalion to the scene. His forces on the Marchfeld were drawn up in front of the bridges facing north, with their left in the village of Aspern (Gross-Aspern) and their right in Essling. Both places lay close to the Danube and could not therefore be turned; Aspern, indeed, is actually on the bank of one of the river channels. The French had to fill the gap between the villages, and also move forward to give room for the supporting units to form up. The corps led by Johann von Hiller (VI), Heinrich Graf von Bellegarde (I) and Prince Friedrich of Hohenzollern-Hechingen (II) were to converge upon Aspern, while Prince Franz Seraph of Rosenberg-Orsini (IV) was to attack Essling. Prince Johann of Liechtenstein's Austrian reserve cavalry was in the center, ready to move out against any French cavalry attacking the heads of the columns. 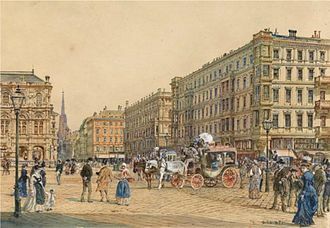 During the 21st the bridges became more and more unsafe, owing to the violence of the current, but the French crossed without intermission all day and during the night. The battle began at Aspern; Hiller carried the village at the first rush, but Masséna recaptured it, and held his ground with remarkable tenacity. The French infantry fought with the old stubborn bravery which it had failed to show in the earlier battles of the year. 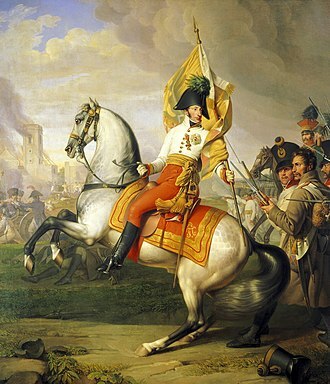 However, the Austrians also fought with fierceness and tenacity that surprised the French, including Napoleon himself. The three Austrian columns were unable to capture more than half the village. The rest was still held by Masséna when night fell. Meanwhile, nearly all the French infantry between the two villages and in front of the bridges had been drawn into the fight on the flank. Napoleon therefore, to create a diversion, sent forward his center, now consisting only of cavalry, to charge the enemy's artillery, which was deployed in a long line and firing on Aspern. The first charge of the French was repulsed, but second attempt was made by heavy masses of cuirassiers. The French horsemen drove off guns, rode round Hohenzollern's infantry squares, and resisted the cavalry of Lichtenstein, but they were unable to do more, and in the end they retired to their old position. In the meanwhile Essling had been the scene of fighting almost as desperate as that of Aspern. The French cuirassiers made heavy charges on the flank of Rosenberg's force, and delayed an assault. In the villages, Lannes with a single division resisted until night ended the battle. The two armies bivouacked, and in Aspern the French and Austrians lay within pistol shot of each other. The emperor was not discouraged, and renewed efforts to bring up every available man. All through the night more and more French troops came across. In ferocious fighting, Austrian grenadiers attempt to storm the fortified granary in the village of Essling. At the earliest dawn of the 22nd the battle was resumed. Masséna swiftly cleared Aspern of the enemy, but at the same time Rosenberg stormed Essling. Lannes, however, resisted desperately, and reinforced by St Hilaire's division, drove Rosenberg out. In Aspern, Masséna was driven out by a counter-attack of Hiller and Bellegarde. Meanwhile, Napoleon had launched a great attack on the Austrian center. The whole of the French center, with Lannes on the left and the cavalry in reserve, moved forward. The Austrian line was broken through, between Rosenberg's right and Hohenzollern's left, and the French squadrons poured into the gap. Victory was almost won when the Archduke brought up his last reserve, leading his soldiers with a colour in his hand. Lannes was checked, and with his repulse the impetus of the attack died out all along the line. Aspern had been lost, and graver news reached Napoleon at the critical moment. The Danube bridges, which had broken down once already, had been cut by heavy barges, which had been sent drifting down stream by the Austrians. Napoleon at once suspended the attack. Essling now fell to another assault of Rosenberg, and the French drove him out again. Rosenberg then directed his efforts on the flank of the French center, slowly retiring on the bridges. The retirement was terribly costly, but Lannes stopped the French from being driven into the Danube. Complete exhaustion of both sides ended the fighting. The French lost over 20,000 men including one of Napoleon's ablest field commanders and close friend, Marshal Jean Lannes, who died after being mortally wounded by an Austrian cannonball in an attack on Johann von Klenau's force at Aspern, which was backed up by 60 well-placed guns. French general Louis-Vincent-Joseph Le Blond de Saint-Hilaire also died as a result of injuries from the battle; his leg was torn off by a cannonball. The Austrians had also suffered similar casualties but had secured the first major victory against the French for over a decade. 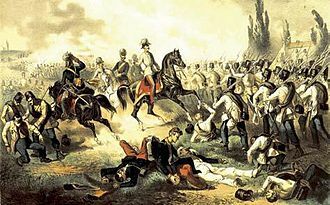 The victory demonstrated the progress the Austrian army had made since the string of catastrophic defeats in 1800 and 1805. The French forces were withdrawn to the island. On the night of the 22nd the last bridge was repaired, and the army awaited the arrival of reinforcements in Lobau. The Austrians, surprised by their victory, failed to capitalize on the situation, allowing the French to regroup. One month later, the French made a second attempt to cross the Danube where Napoleon gained a decisive victory over the Austrians at the Battle of Wagram. The Löwe von Aspern (Lion of Aspern), a large stone sculpture in front of St. Martin's Church, is a monument commemorating the battle. Patrick Rambaud, a French author, wrote a fictionalized account of the conflict entitled "The Battle" using many first-hand sources. Just looking from the French perspective, the novel provides a rather realistic description of combat in the Napoleonic era, as well as detailed depictions of famous commanders such as Napoleon, Massena, and Lannes. The concept and notes for the book originally came from noted French author Honoré de Balzac. Jean Baptiste Antoine Marcellin de Marbot, one of Marshal Lannes aide-de-camps, wrote in his memoirs of the battle, in which he had to observe the last moments of his close friends, and describes the amount of bloodshed and sadness which came to the Grande Armée after the crossing of the Danube. The army surgeon Dominique-Jean Larrey also described the battle in his memoirs and mentions how he fed the wounded at Lobau with a bouillon of horse meat seasoned with gunpowder. ^ John H. Gill, 1809. Thunder on the Danube: Napoleon's Defeat of the Habsburgs. Volume II: The Fall of Vienna and the Battle of Aspern, Frontline Books, London, 2009, 129-133. ^ a b c d e f g h One or more of the preceding sentences incorporates text from a publication now in the public domain: Chisholm, Hugh, ed. (1911). "Aspern-Essling, Battle of" . Encyclopædia Britannica. 2 (11th ed.). Cambridge University Press. pp. 767–768. ^ Parker, Harold T. (1983 reprint) Three Napoleonic Battles. (2nd Ed). Duke University Press. ISBN 0-8223-0547-X. Page 83 (in Google Books). Referencing Dominique-Jean Larrey, Mémoires de chirurgie militaire et campagnes, III 281, Paris, Smith. ^ Larrey is quoted in French by Dr Béraud, Études Hygiéniques de la chair de cheval comme aliment, Musée des Familles (1841-42). Wikimedia Commons has media related to Battle of Aspern. Battle of Aspern-Essling[permanent dead link] by David Johnson in journal Military History, April 2001. The Battle of the Basque Roads, Battle of Aix Roads was a naval battle during the Napoleonic Wars off the Island of Aix. 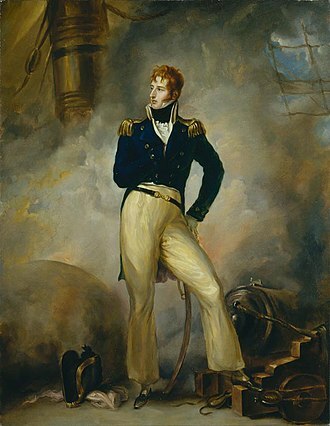 On the night of 11 April 1809 Captain Lord Cochrane led a British fireship attack against a powerful French force anchored in the Basque Roads, in the attack all but two of the French ships were driven ashore. The subsequent engagement lasted three days but failed to destroy the entire French fleet, Cochrane accused the British commanding officer, Admiral James Gambier, of being reluctant to press the attack. Gambier demanded a court-martial, and was exonerated, Cochranes career in the Royal Navy ended. The French Navy continued to operate against the British from the Basque Roads until the end of the Napoleonic Wars, the Basque Roads are a sheltered bay on the Biscay shore of France, bounded by the Île dOléron to the west and the Île de Ré to the north. The port of La Rochelle stands at the northeast corner of the roads, during the Peninsular War in Spain and Portugal the Duke of Wellington depended on maritime supply. The French fleet in the Basque Roads operated against the British supply ships, to protect the convoys, the Royal Navy maintained a blockade of the Basque Roads, but this was expensive and never wholly effective. In late October 1808, Napoléon sent Decrès orders for the squadrons at Lorient and Rochefort to deliver reinforcements, the continual presence of large British squadrons, impeded their departure. On 7 February 1809, Napoleon ordered Admiral Willaumez to raise the blockades with the Brest fleet to allow these small squadrons to make their way to Martinique, two weeks later, Willaumez finally set out with eight ships-of-the-line and two frigates towards Lorient. Fearful of being caught by the British, Willaumez continued on his way south to Rochefort, with the subsequent arrival of a large British fleet, Willaumez was trapped in Rochefort. A British squadron arrived on the scene and held the French there until Gambier arrived with the rest of the Channel fleet to impose a blockade, the British Admiralty became concerned about the concentration of such a large segment of the French fleet in one place. If the ships escaped they could ferry supplies to Napoleon’s Peninsular forces, with these reasons in mind, the First Lord of the Admiralty, Lord Mulgrave, proposed an attack on the French fleet at anchor using fire ships. Cochranes superior officer, Lord Gambier, commanding the Channel Fleet, was opposed to the plan, calling it a horrible and anti-Christian mode of warfare. Cochrane was given twenty-one fireships to command, but he was focusing on his own invention, explosion ships. Gambiers opposition and Mulgraves persuasiveness meant that full responsibility for executing the plan fell to Lord Cochrane, on the evening of April 11,1809 Cochrane led the way into Basque Roads with two explosion ships, followed by 25 other ships. 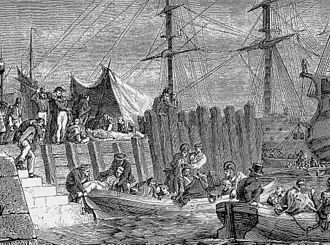 Because of delays resulting from Gambier’s indecision, the French were alert to the British plan, on the night of April 11,1809 Cochrane floated in on the flood-tide aboard the foremost explosion vessel with the other explosion ships following. They managed to escape with their dog just in time, the explosion ships succeeded in breaking the mile-long boom of heavy spars and chains the French had placed to block the British ships from engaging the French. The battle led to the breakup of the Fifth Coalition, the Austrian and British-led alliance against France. In 1809, the French military presence in Germany was diminished as Napoleon transferred a number of soldiers to fight in the Peninsular War. 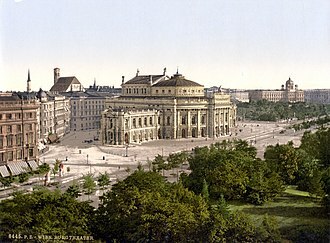 As a result, the Austrian Empire saw its chance to some of its former sphere of influence and invaded the Kingdom of Bavaria. Recovering from his surprise, Napoleon beat the Austrian forces. Despite the string of defeats and the loss of the empires capital, Archduke Charles salvaged an army. This allowed the Austrians to continue the war but, towards the end of May, Napoleon resumed the offensive and it took Napoleon six weeks to prepare his next offensive, for which he amassed a 165, 000-man French and Italian army in the vicinity of Vienna. The Battle of Wagram began after Napoleon crossed the Danube with the bulk of forces during the night of 4 July and attacked the 145. Having successfully crossed the river, Napoleon attempted an early breakthrough, the Austrians were thinly spread in a wide semicircle, but held a naturally strong position. After the attackers enjoyed some success, the defenders regained the upper hand. Bolstered by his success, the day at dawn Archduke Charles launched a series of attacks along the entire battle line. 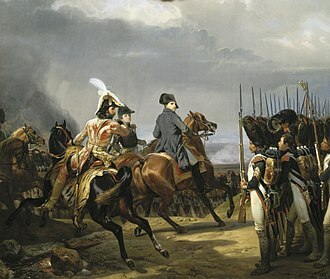 The offensive failed against the French right but nearly broke Napoleons left, the Emperor countered by launching a cavalry charge, which temporarily halted the Austrian advance. He redeployed IV Corps to stabilise his left, while setting up a grand battery, towards mid-afternoon on 6 July, Charles admitted defeat and led a retreat, frustrating enemy attempts to pursue. After the battle, Charles remained in command of a cohesive force, the Grande Armée eventually caught up with him and scored a victory at the Battle of Znaim. With the battle raging, Charles decided to ask for an armistice. The two-day battle of Wagram was particularly bloody, mainly due to the use of artillery on a flat battlefield packed with some 300,000 men. 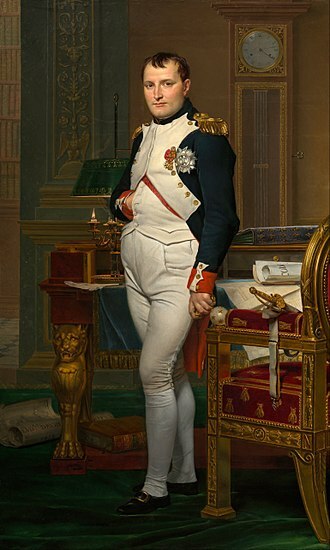 Although Napoleon was the winner, he failed to secure a complete victory.